Well, it’s Day 24, and we’re continuing our journey through the 1990s with John Carpenter’s In the Mouth of Madness (1994). I have to say: I’m not a big fan of this movie. I realize that this will be perceived by many as blasphemy (sorry, Charles and Micah…and Mike…and the rest of planet Earth), but I have a sneaking suspicion that I might just not be that into John Carpenter films. They are interesting, and revolutionary, and blah blah blah. The only one I can remember actually liking, however, is Halloween, and I even have certain beefs with that! It is admittedly a classic, and helped to pave the way for the Slasher genre…but I digress. 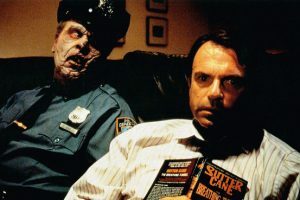 In the Mouth of Madness = thumbs down in my book. 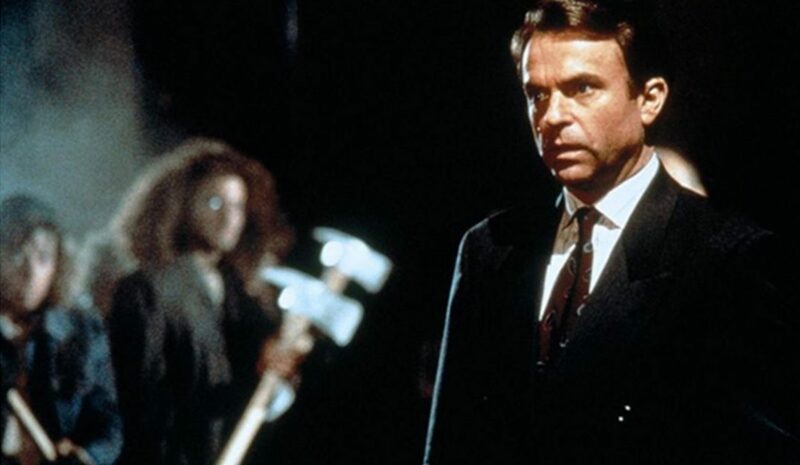 The movie stars Sam Neill (in his best attempt to be Pierce Brosnan) as John Trent, an insurance investigator who believes he smells something fishy about the disappearance of superstar horror author, Sutter Cane. The script both pokes fun at, and pays homage to, the success of Stephen King–a man who has achieved tremendous acclaim by understanding that what most people want, beyond the incomprehensible phenomenon of 50 Shades of Grey, is to poop their pants in fright. As Trent investigates Cane’s mysterious vanishing act, he enlists (read: is forced to accept) the help of his terrible Girl Friday, Linda Styles (played by a hopelessly lackluster Julie Carmen). Styles is Cane’s editor, as well as a fervent champion of the author’s work, and she assures Trent that Cane’s disappearance is no orchestrated PR stunt. As the pair wend their way through the creepily quaint town of Hobb’s End, Styles and Trent begin to realize that certain aspects of Cane’s novels are coming to life around them. To go a step farther, they believe that the entire TOWN has been forged from the sinister depths of Sutter Cane’s mind, and anybody foolish enough to remain will surely be a page-bound prisoner forevermore. As the movie stares down one eerie rabbit hole after another, we are given to understand that anybody who reads Sutter Cane’s novels (or sees the movie adaptations) goes stark raving mad. There are some interesting things said here about our perception of reality, sanity, and what is normal…but it’s not enough to carry the film for me. It’s too weird. That’s the word I keep circling back to: W-E-I-R-D. I’m trying to think of other things to say about the movie, or other ways I could possibly describe it, but that’s the word that continually springs to mind. In the Mouth of Madness is not bad, necessarily, it’s just freakin’ weird. I don’t recommend it, as I feel you probably have better things to do with your time; but it could be worth it if you’ve, say, just ingested a boatload of hallucinogenic mushrooms and are currently contemplating how crazy hands are. Tomorrow, Charles will be reviewing a little film called Ringu (1998), which gives me the willies to even type. So, you’ll definitely want to come back for that one. In the mean time, be sure to catch up on any 31 Days of Horror movies you might have missed, and stay tuned for our final week! !